Патент США. Способ производства хлеба из вспененного теста. С помощью нашего бюро автор из Воронежа получил патент в стране, патентная система которой считается самой развитой в мире. 2. Направлена декларация, необходимая по закону Соединённых Штатов. 3. Мы заказали в Роспатенте заверенную копию первичных материалов заявки и выслали её в США. 4. Эксперт патентного ведомства США вынес предварительный отказ на основании существующих решений. 5. Мы внимательно изучили противопоставленные патенты, провели совещание с автором и американским патентным поверенным, скорректировали формулу изобретения и направили ответ на предварительный отказ. This is the ressponse to the Nonfinal Office action of November 18, 2014. We amended the claims to clarify the difference with the prior art. The most important difference is that the dough is FOAMED by special mechanical knives and this is done separately for each portion of bread to be baked. The inventors do not use yeast or air flow under pressure to make the foamed dough. the technology is very important for gluten-free bakery. Remarks/Arguments begin on page 2 of this paper. 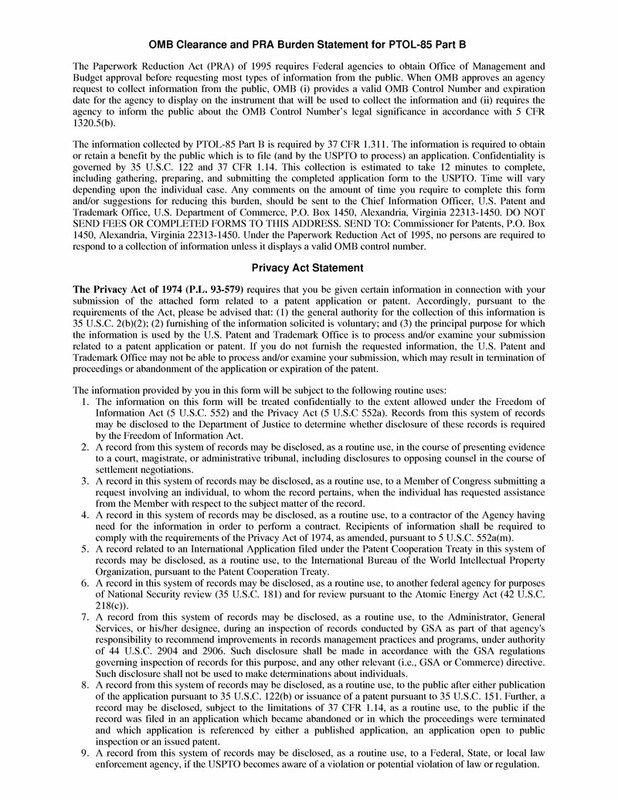 The Office Action mailed November 18, 2014 has been received and carefully considered. Claims 1-10 remain in this application. Claim 1 is an independent claim. 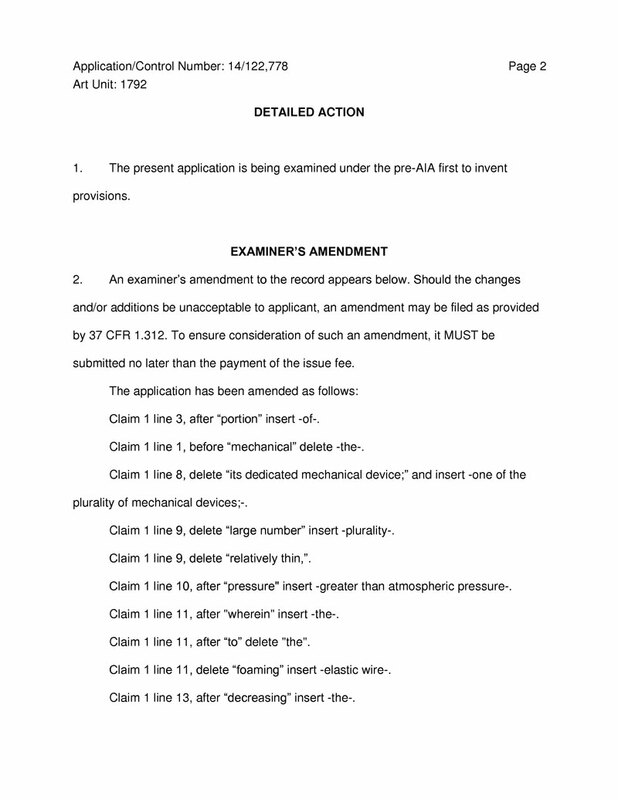 Claims 1-3, 5-8 and 10 have been amended to specify the difference with the prior art. 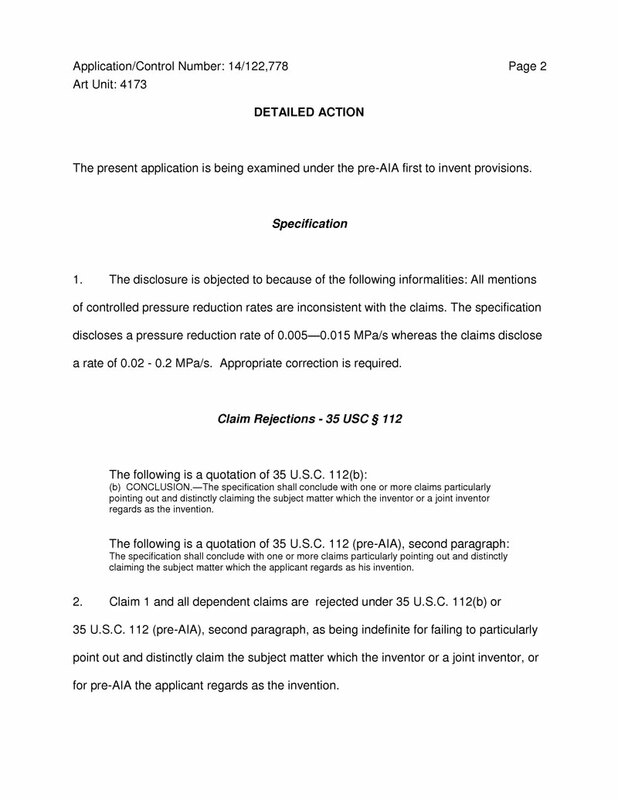 The Examiner has objected to the specification and pointed out informality: that the pressure reduction specified in claims (namely 0.02-0.2 MPa/s) is inconsistent with the pressure reduction rate of the current specification (namely 0.005-0.015 MPa/s). Current specification discloses the claimed rate of 0.02-0.2 MPa/s in abstract, paragraphs , , . and throughout. 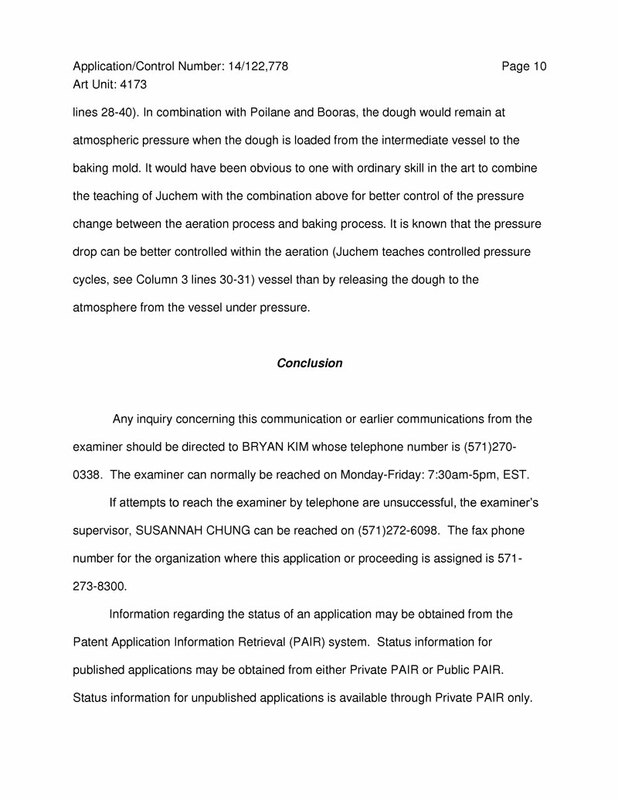 Moreover paragraph  reads, “in the proposed method the pressure is dropped around each portion of the aerated dough with a controlled speed between 0.02-0.2 MPa/s, providing minimum foam destruction and maximum dough rise ”; “[device 7 is] supplying and regulating drops in pressure” (paragraph ). Therefore, objection to the specification has been overcame. 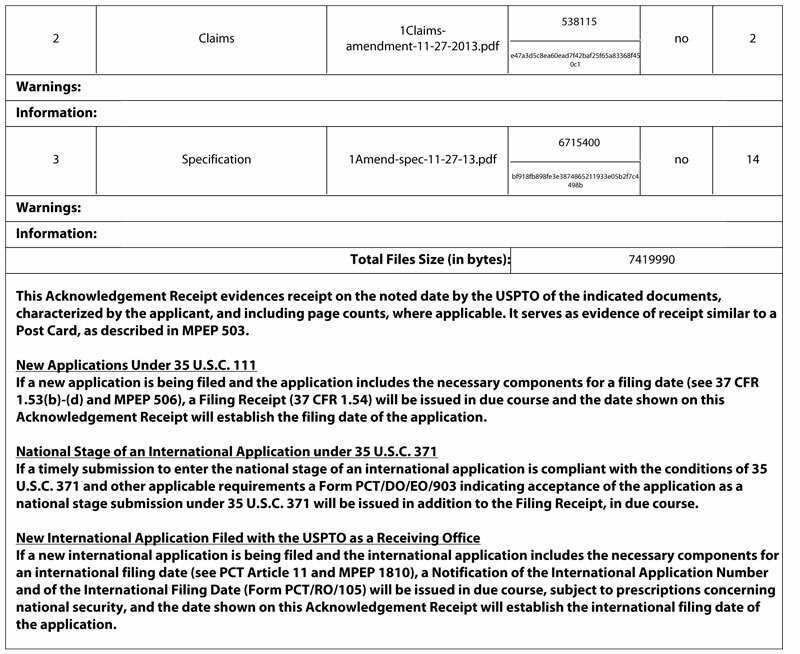 Claim 1 and all depended claims have been rejected under 35 U.S.C. 112(b), second paragraph, as being indefinite for failing to particularly point out and distinctly claim the subject matter. Regarding claim 1, the limitation of “bread” in the last line in unclear as to whether if refers to the bread of line 1 or refers to different bread. The amendment clarifies this issue. Support for this amendment can be found in Example 1 paragraph , which shows a continuous process of bread making, which begins with mixing of the dough and leads to aerated dough being baked into the final bread product. 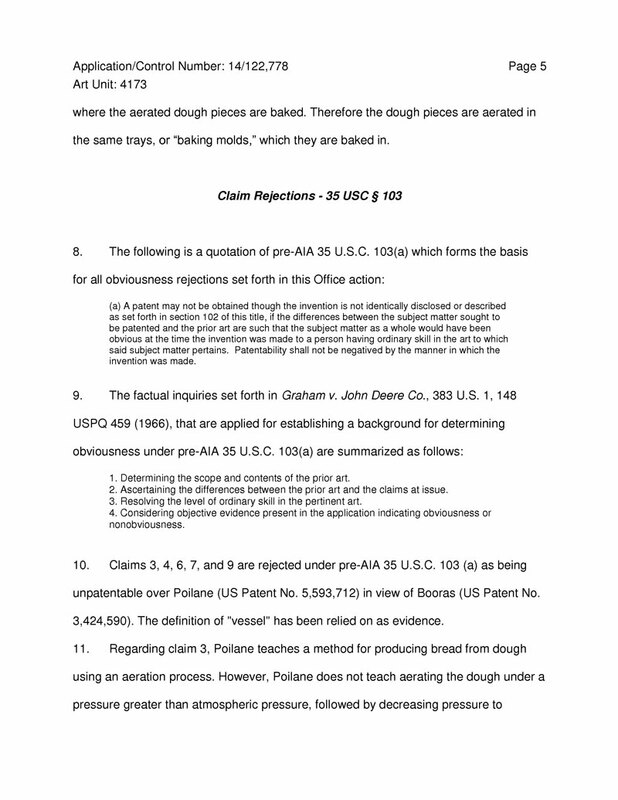 Regarding claim 8, the limitation “wherein the loading of aerated dough” in line 2 is unclear whether the limitation refers to loading of the same or different aerated dough of claim 1 line 1. The claim was meant to refer to the same bread. Amendments: To expedite prosecution and without conceding to the Examiner’s positions, Applicant has amended the claim 8 to read, inter alia, “The method according to claim 7, wherein the loading of said aerated dough”. Support for this amendment can be found in Example 1 paragraph , which shows a continuous process performed on the same dough, which begins with mixing of the dough and leads to its further aeration. 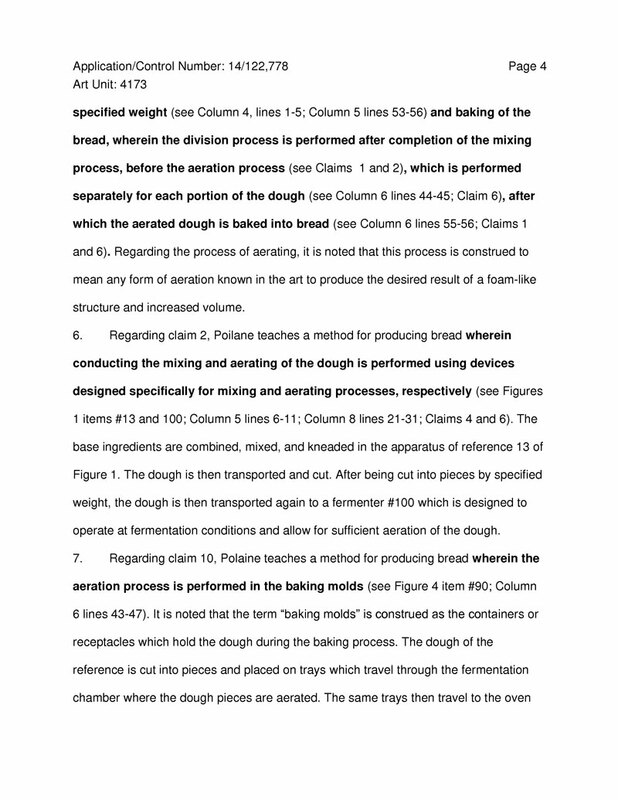 Regarding claim 10, the limitation “wherein the aeration process is performed in baking mold” in lines 2 and 3 is unclear whether the limitation refers to the same or different baking molds at the end of claim 7. 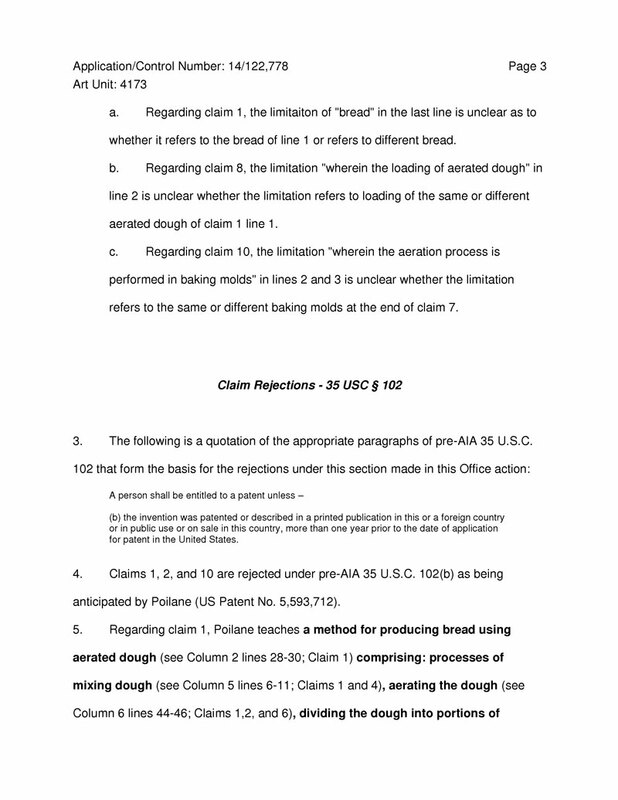 The applicant verifies that the baking molds of claim 10 are different baking molds to which the claim 7 is referring to, but same baking molds as to which is referred to in claim 1. Support for his amendment can be found in the Example 2, paragraph  which stated that the after mixing and divination the dough in loaded in the baking molds 1 in which it is further aerated by device 6. We replaced the word "aeration" with the word "foaming", which better describes the process. The support can be found in many paragraphs of the description as filed. 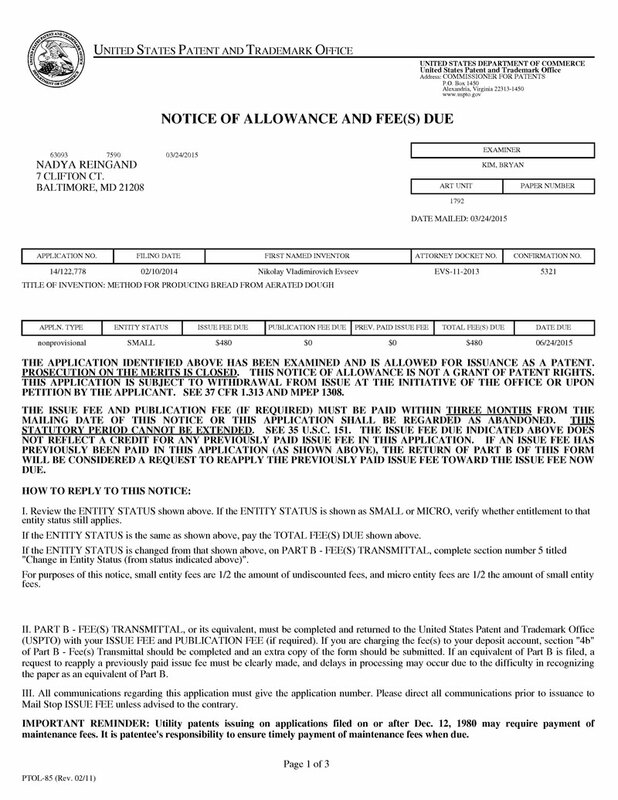 Claims 1, 2 and 10 has been rejected under pre-AIA U.S.C. 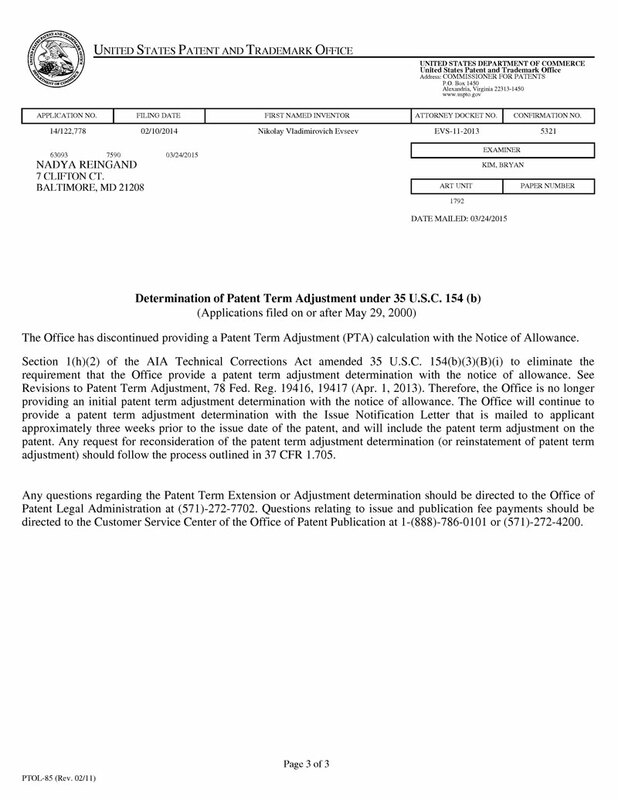 102(b) as being anticipated by Poilane (US Patent 5,593,712), hereinafter “Poilane”. We respectfully disagree for the reasons started below. The foaming of the dough in Poilane is achieved by the fermentation (col. 6, lines 44-46) which requires yeast whereas the current Application does not require yeast and is geared towards the process of manufacturing of unleavened bread specifically using mechanical foaming. 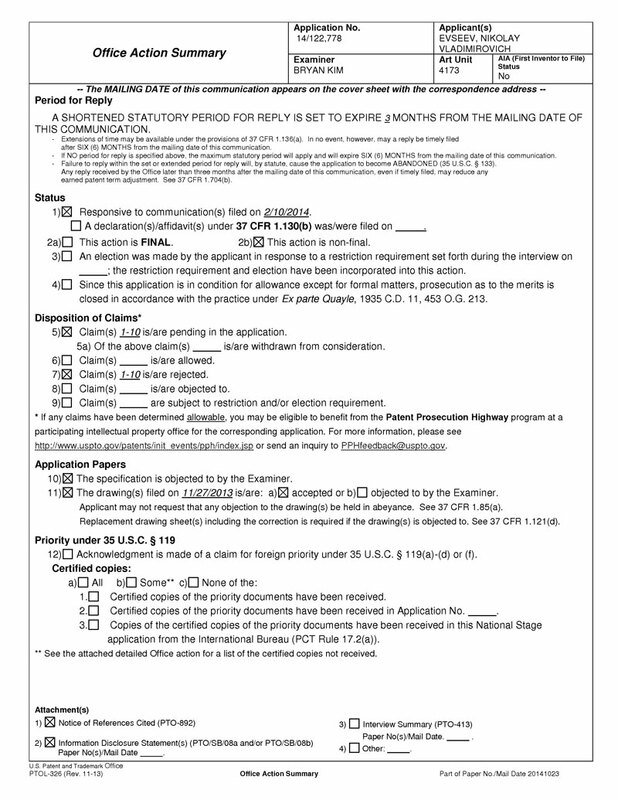 The foaming of the claimed process of the current Application can be further divided into two separate stages. First stage of the foaming takes place when the dough is agitated by the mechanical foaming device under additional applied pressure of no less than 0.3MPa which allows more gas to be dissolved in the dough, in the second stage, aeration stage takes place when the pressure in foaming chamber is reduced to the atmospheric and additional gas is absorbed by dough in the form of the small bubbles which further supplements foaming of the dough. Poilane utilizes yeast as means for aerating the dough; moreover, Poilane reference requires additional time to allow yeast to raise the dough. Current Application does not require neither yeast nor additional in order for the dough to be aerated. Furthermore, Poilane reference mixes all the incidents including yeast (aerator) at the first stage of the process and then divides the dough into pieces and places them into the molds where they will be further baked hence the aeration takes place thought the whole process : beginning at mixing and ending at the time when the dough is effectively baked. In the current Application, mixing and foaming are two separate staged explicitly spaced in time and unambiguously performed by the different devices. The dough mixing and foaming processes are performed using different devices, preferably suited to performing mixing and aeration processes, respectively, since the mixing and aeration processes have different objectives - the mixing process combines dry ingredients with liquid ones, resulting in a homogenous mass of dough, and the aeration process saturates the homogenous mass with air. Therefore, in order to mix the basic ingredients use a dough mixer apparatus 2 with strong rigid mixing elements 3 designed for heavy loads, having minimal surface contact with the dough, and for the foaming process use aeration (foaming)devices 6 similar to the “beater”, having a large amount of relatively thin, elastic wire-knives, which are designed to create in the homogenous dough mass upon rotation as many cuts as possible, so air can pass into them and be evenly distributed inside the dough. This increases the effectiveness of performing each of the aforementioned processes, lowers their power consumption and increases productivity of the processes, as well as increases the quality of the foamed dough produced. [Similarly to finish up the foaming process] a device 7 reduces the pressure inside the mold to atmospheric, with the pressure decrease performed at a controlled rate, between 0.02-0.2 MPa/s, ensuring  maximum dough rise.” (see paragraph ). The current application resolves the problems associated with the leaven bread manufacturing as applied to the flours having insufficient gluten content. Upon addition to the yeast in the leavened bread baking, the dough is constantly pumped with the CO2 produced by the yeast, as gluten become elastic it creates a physical barrier which prevents CO2 from escaping the dough, thus raising the dough and producing a foaming effect. Yeast produces gas between first 4 to 6 hours upon mixing. If the flour does not contain sufficient amount of gluten, the physical barrier becomes compromised by plurality of “holes”, moreover, the less gluten there is in the flour, the bigger the said “holes” are. This leaves more chances for the newly produced CO2 to escape. The current Application solves this issue by using mechanical foaming which does not really on the gluten to contain the aerator which is CO2 in case of the leavened breads. In the classical bread making of the leavened dough, it takes yeast 4-6 hours to produce all possible CO2 thus be maximally effective in foaming of the dough (considering the fact that it has enough gluten to retain the produced CO2), whereas in the unleavened bread production process of the current application, the complete foaming process takes 30-60 seconds. Air is locked in inside the dough once the baking temperature reaches 90oC (see examples 1-3) that accounts for approximate 10-15 minutes. Thus, overall process from beginning of the foaming until the air is locked in is 20 minutes at most. This 20 fold time reduction distinguishes the mechanical and yeast aerations to the point of being NONANALOGOUS art. Successful, low gluten and/or gluten free unleavened bread preparation is an important goal of the current state of the art bread making industry with demands on the gluten free foods steadily growing in the past decade. Another aspect of the current invention, left unspecified by above speculation, is the pressure at which the foaming take place as well as importance of decreasing the pressure to atmospheric is performed at a controlled rate. 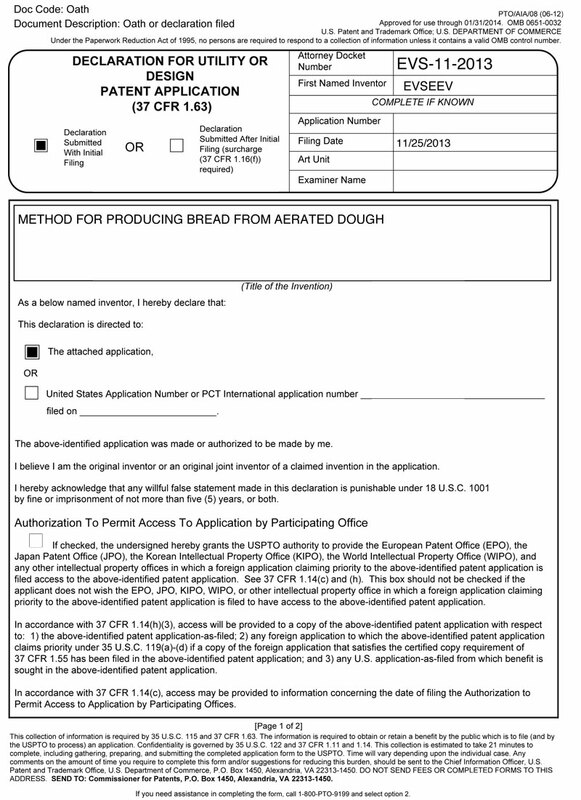 1) “describes one of the examples of the making the bread according to the process of current Application and specifies, “Inside the baking mold, device 7 creates the specified pressure, for example 0.4 MPa and the portion of dough is aerated by the aeration device 6 (stage II) at a rotation speed of 16 c-1 for a duration of 40-60 seconds, resulting in dough saturated with air via mechanical distribution throughout the dough mass, also due to the additional dissolved air in the soluble components of the dough, a result of aeration under increased pressure. Therefore, we respectfully disagree that the Poilane reference reads on the mechanical foaming per claim 1 of the current application. Support for this amendment could be found in paragraphs . Rejections to claims 2 and 10 have been overcome as being dependent on the independent claim(s) 1 as applied above. Regarding claim 2, Poilane fails to teach separate devices for mixing and mechanical dough aeration. There is merely no device used for aeration (instead yeast produced and gluten retains the CO2). Kneading of the dough (reference to apparatus 13 on Fig.1) cannot be considered comparable and analogous to mechanical foaming geared towards “having a large amount of relatively thin, elastic wire-knives, which are designed to create in the homogenous dough mass upon rotation as many cuts as possible (paragraph ) as well as 4-6 hour fermentation process (fermenter #100) is not similar to the mechanical foaming of the current Application as described, supra, in the arguments gears towards rejection of claim 1. Regarding claim 10, Poilane fails to teach the separate devices for mixing and mechanical foaming as it was presented, supra. Moreover the tray #90 (Fig. 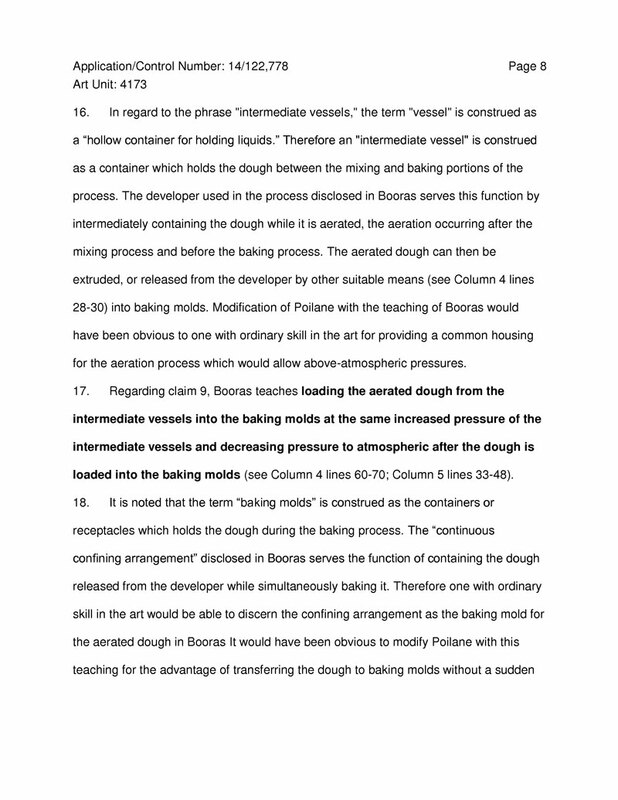 4) of Poilane reference fails to read on the baking mold of claim 10 of the current application. Baking mold of the claim 10 must have a non-stick coating, be attached to the nest and be able to withstand the foaming pressure of no less than 0.3MPa. Furthermore according to current Application, “baking mold 1 is attached in nests 21 for fixation” (see para ). Firstly, all baking molds must have a non-stick coating prior to foaming, since coating a mold before performing the aeration process leads to mixing of the lubricant with dough during its aeration process in the baking mold, which is unacceptable. Secondly, aeration in molds always necessitates using molds of a certain configuration, to which all the foaming devices must be compatible [with]” (see paragraph  towards the bottom). Therefore, the mold has to be in the designated shape in order to be able to support the pressure buildup during the foaming. Therefore, we respectfully disagree that the tray of Poilane read of the baking mold of the current application. 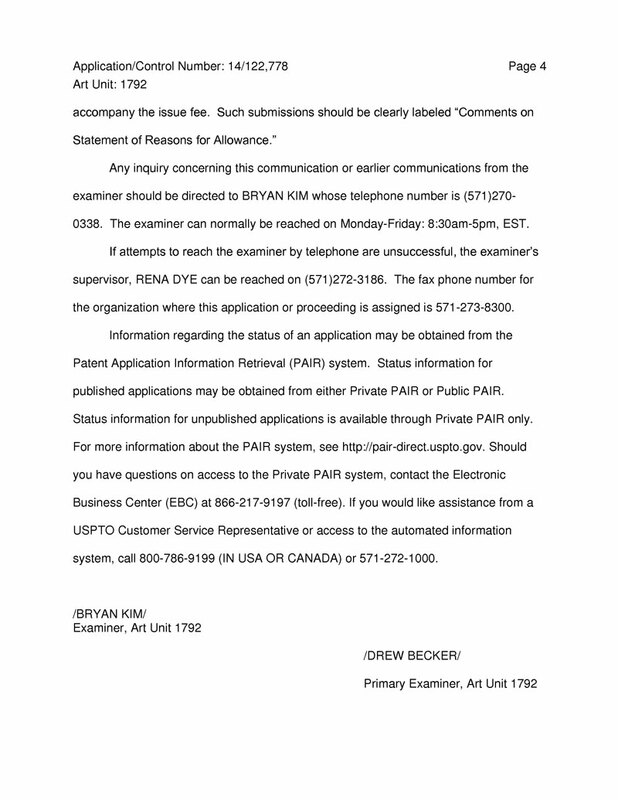 Claims 3, 4, 6, 7 and 9 has been rejected under pre-AIA U.S.C. 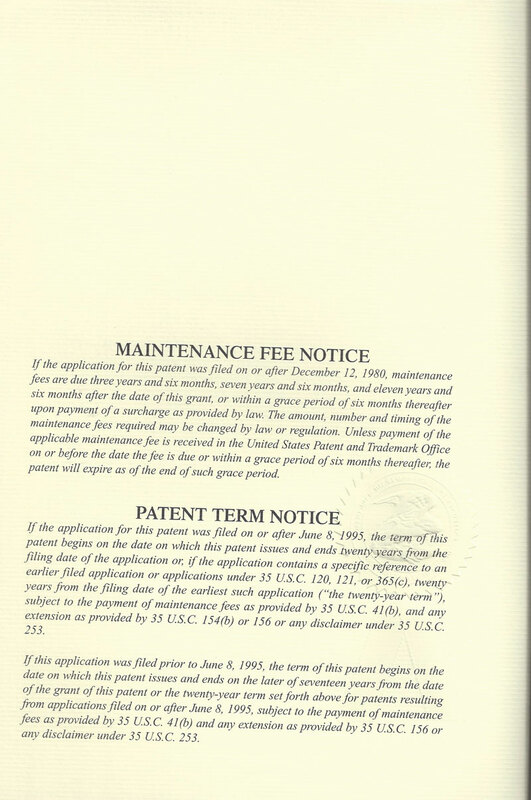 103(a) as being unpatentable over Poilane (US Patent 5,593,712), hereinafter “Poilane” in view of Booras (US Patent No. 3,424,590), hereinafter “Booras”. We respectfully disagree for the reasons started below. Rejections to claims 3, 4, 6, 7 and 9, have been overcome as being dependent on the independent claim(s) 1 as applied above. The Examiner stated that the definition “vessel” has been relied on as evidence. Regarding claim 3, combination of the Poilane/Booras references fail to teach the mechanical aeration of the unleavened bread of the current Application, aerating the separate portions of the dough. Booras differs from Poilane only in the method of deliverance of the CO2 to the dough. In case of Poilane, the conventional method is used where yeast is uniformly mixed with the other ingredients; upon starting the production of CO2 by yeast, it is held by gluten and thus the dough holds the desired shape until it is finally baked in the oven. In case of Booras, the CO2 is added as a leavening agent directly without involving yeast. “Assuring uniform rising of the dough by the use of metered amounts of leavening agents capable of producing a fast rise in the dough. Typical of the leavening agents which may be employed is carbon dioxide, which is preferred.” (col. 3, 25-30). “When carbon dioxide is used as the leavening agent, it is supplied in an aqueous solution to the dry ingredients which go to make up the dough. In order to insure uniformity of rising, amounts of carbon dioxide may be supplied to the wet dough prior to extrusion to give primary rising of the dough. Alternatively all the CO2 necessary for leavening could be supplied directly to the dough as a gas and the water solution of CO2 omitted.” (col. 3, lines 35-445). Both Poilane and Booras as well as combination of thereof rely on gluten for the CO2/gas retention. For example, Booras teaches “the fluid mixture is then pumped to the developer where the gluten further develops to give the dough good cohesion and gas-retaining properties.” (col. 4, lines 5-10). During the development of Booras considered as aeration by the Examiner, CO2 or other gas quickly enters into the dough’s structure (in a matter of a few seconds or less than a second per col. 4, line 59). There is no mechanical foaming (as described, supra) taking place in either Poilane or Booras as well as in combination thereof. If all claimed limitations is considered the mechanical foaming would have to be part of the modification for the prior art. If proposed modification would render the prior art invention being modified unsatisfactory for its intended purpose, then there is no suggestion or motivation to make the proposed modification. In re Gordon, 733 F.2d 900, 221 USPQ 1125 (Fed. Cir. 1984). If the proposed modification or combination of the prior art would change the principle of operation of the prior art invention being modified, then the teachings of the references are not sufficient to render the claims prima facie obvious. In re Ratti, 270 F.2d 810, 813, 123 USPQ 349, 352 (CCPA 1959). The current invention is geared towards the unleavened bread manufacturing, which does not hold its reliability in the yeast/gluten components, and usually takes significantly less time vs. leavened bread production. Thus if the dough would undergo mechanical aeration, with the further baking within a short period of time (which is the reason why unleavened breads were invented in the first place, a fact which the person of the ordinary skill in the art at the time of the invention would be familiar with) yeast wouldn’t have a chance to make enough CO2 and gluten wouldn’t have a change to hold the produced CO2. Conversely, if we to modify the Poilane reference with the mechanical aeration, the principle of operation would change. Mechanical aeration of the combined teachings of the Poilane and Booras are non-existent, thus the principle of operation of the combined reference would have to be change and which is not sufficient to render the claims prima facie obvious per MPEP § 2143.01. Moreover, it would not be obvious to combine references since both Poilane and Booras teach the leavened bread manufacturing aeration for which leavened bread aeration is a NONANALOGOUS (§ 2141.01(a) Analogous and Nonanalogous Art). Aeration of the non-leavened bread has its own set of problems which is the current invention proposes the solution to. To support this allegation, here we present an example, the current application used the Triticosecale type flour which contains less gluten, but has a better nutritional value and is a good candidate for the wheat replace in the developing countries; moreover this particular grain has recently received an attention as a potential energy crop. In making of the loafs of bread from Triticosecale flour it is essential for the dough to be divided before the aeration takes place otherwise the structure created by the aeration would collapses, and baked goods produced would be unsatisfactory to say the least. In Poilane, though the dough is divided into the separate portions before the aeration, aeration itself is mainly produced by the fermentation of the yeast for hour(s) plus there is no mechanical aeration that takes place – thus aeration of Poilane can hardly called an analogous aeration. Addition of Booras makes the art even less applicable, though there is no time for fermentation required, in the Booras reference, division of the dough into portions has to happen only after the aeration takes place. The current application calls for the division to happen before aeration for the several reason stated, infra. 2) Loafs of the baked bread would not be identical – since the cutting of the larger portions of the dough would require a long time, and the residence time of the dough would be different for each dough piece, it will create less uniform structure and thus non-uniform quality. The process that combination of the Poilane and Booras cannot create an analogous process (to the process of the current Application) in order to make the low gluten flour suitable for baking. Therefore, we respectfully disagree that aeration offered by the combination of the Poilane/Booras references can be offered as an analogues to the mechanical aeration of the current application. According MPEP § 2141.01(a) Analogous and Nonanalogous Art, Section I. TO RELY ON A REFERENCE UNDER 35 U.S.C. 103, IT MUST BE ANALOGOUS PRIOR ART Rather, a reference is analogous art to the claimed invention if: (1) the reference is from the same field of endeavor as the claimed invention (even if it addresses a different problem); or (2) the reference is reasonably pertinent to the problem faced by the inventor (even if it is not in the same field of endeavor as the claimed invention). See Bigio, 381 F.3d at 1325, 72 USPQ2d at 1212. Obviously, in this case inventor is faced with the different set of problems imposed by the unleavened bread production counter to the fermentation associated with CO2 production by the yeast, alternative ways to supply CO2 under pressure, as well as CO2 absorption and retention (gluten wall buildup). Pressure created in the developer of Booras is supposed to facilitate absorption of the CO2 separately introduced into the endless dough bar, the current reference does not require additional gas to be introduced. Furthermore, the combination of Poilane/Booras references remains silent about the mechanical non-yeast aeration as well as the obviousness requires a reasonable expectation of success (MPEP § 2143.02). 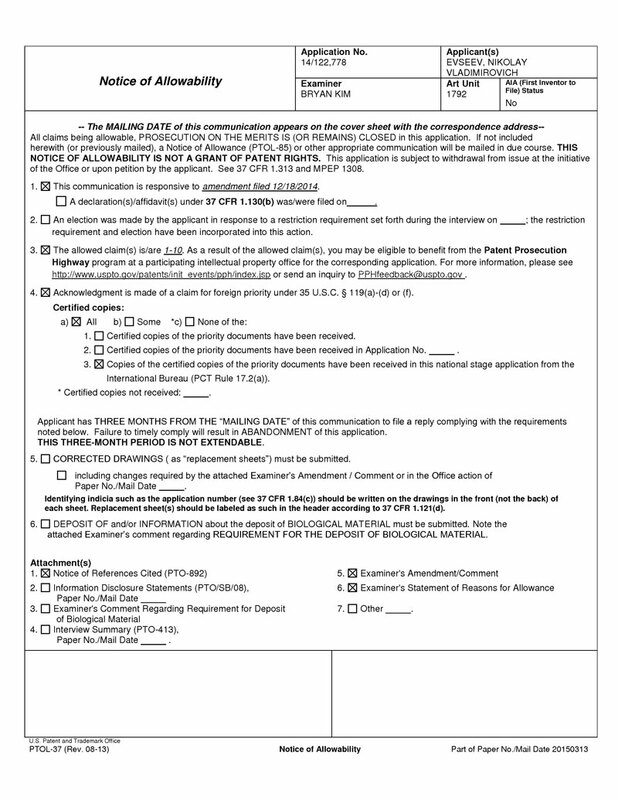 According to MPEP § 2143.02 Reasonable Expectation of Success Is Required [R-08.2012]. I. OBVIOUSNESS REQUIRES A REASONABLE EXPECTATION OF SUCCESS. 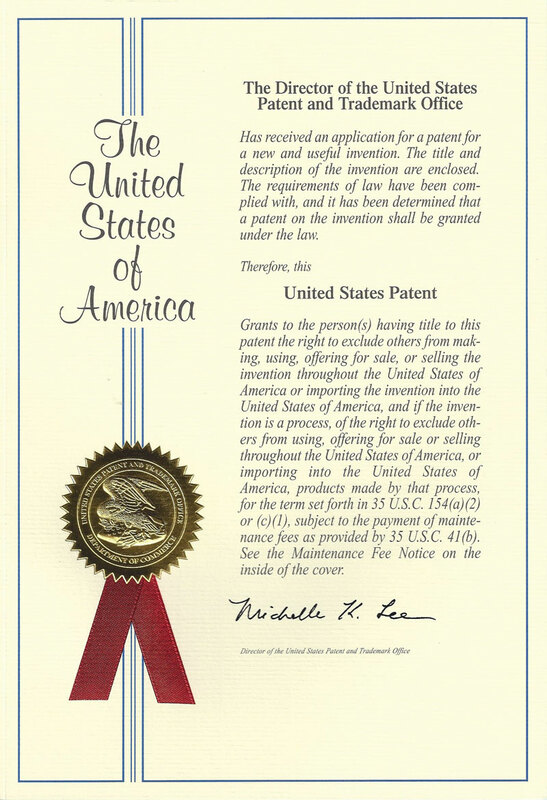 Where there is a reason to modify or combine the prior art to achieve the claimed invention, the claims may be rejected as prima facie obvious provided there is also a reasonable expectation of success. 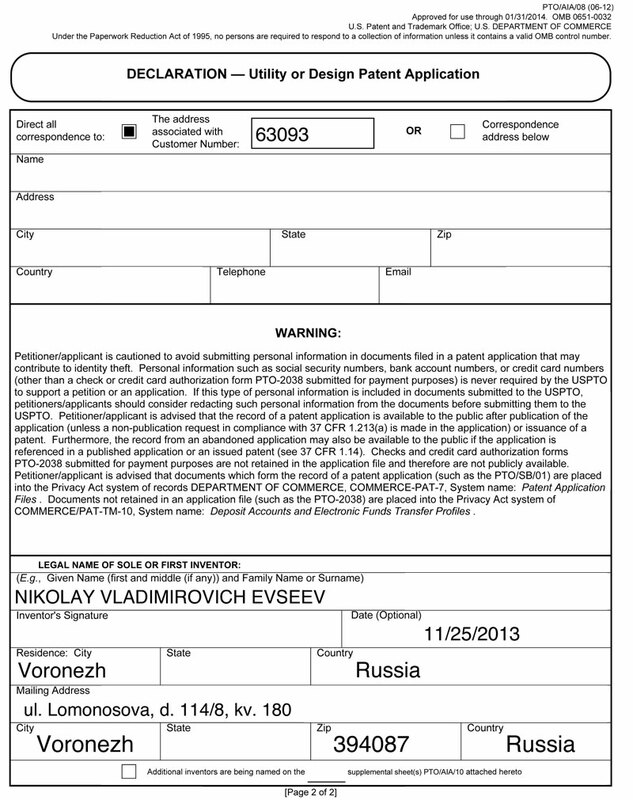 In re Merck & Co., Inc., 800 F.2d 1091, 231 USPQ 375 (Fed. Cir. 1986). Obviously, in this case it wouldn’t be reasonable to expect the leavened bread to be baked following the unleavened bread recipe. Therefore, we respectfully disagree that the combination of Poilane/Booras teach the mechanical aeration as well as the pressure applied to the mechanical aeration as outlined in the claim 1 as well as that the above stated references can be combined according to MPEP section MPEP 2143.01. Regarding claim 4, we respectfully disagree the mechanical aeration is an analogous process, as well as it would be obvious to combine the Poilane and Booras in order to read on the rate of the pressure reeducation, using similar arguments as in response to rejection to claim 3, supra. Regarding claim 6, combination of Poilane/Booras fails to teach the removal of the mechanical aerator. 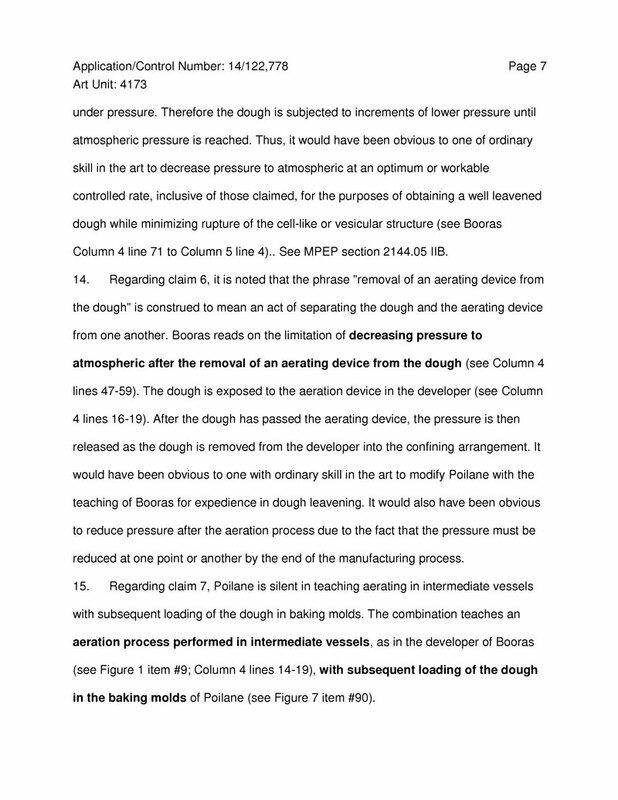 Regarding claim 7, the combination of Poilane/Booras references fails to teach the mechanical aeration in the separate vessel as well as we will have to disrupt the process of Poilane and place the dough into the tray#90 after aeration while Poilane teaches the dough is fermented while residing in the swing tray #90 (column 8, lines 20-35). The “dough pieces reside in the said fermentation chamber maintained at a constant temperature, of the order of 40° C., for an average period of the order of one hour” (column 8, lines 30-31). On the other hand, Booras cannot mend this discrepancy with claimed limitation and fails to teach “intermediate vessels inside of which the dough is temporarily transferred for foaming” since the Boora’s dough is an endless bar (claim 1) and entirety of the dough cannot be transferred inside the vessel. Therefore, Booras fails to teach the aeration taking place on the separate pieces of dough, but rather the essence of the Booras’ invention in the endless bar of the dough (claim 1). Therefore we respectfully disagree that combination of Poilane/Booras teach the limitations of claim 7. 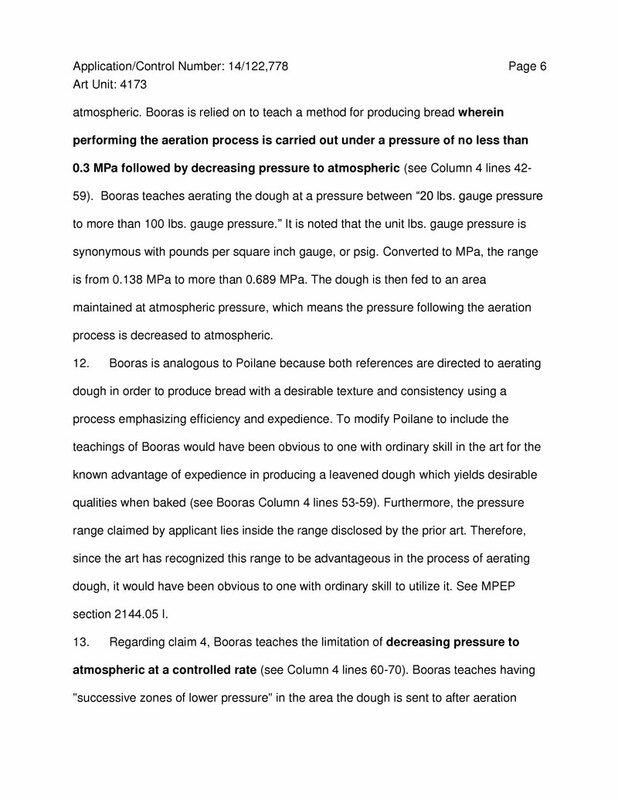 Regarding claim 9, Boors fails to teach the loading of the aerated dough from intermediate vessels into the separate baking molds as separate pieces as it was described, supra, in the response to rejection of claim 7. Moreover Booras teaches away from the current application by specifying the endless bar of dough is advantageous in order to eliminate individual load pans; “[a]nother object of [Boora’s] invention is to provide a new and improved method of making bread which eliminates the use of individual loaf pans.” (col.1, lines 61-63). According to MPEP §2145 X. D., where cited art teaches away from a claimed feature, the cited art is not available for the purposes of an obviousness rejection (References Teach Away from the Invention or Render Prior Art Unsatisfactory for Intended Purpose). Therefore, we respectfully disagree that the claimed limitation of claim 9 are taught by the combination of Poilane and Booras reference. 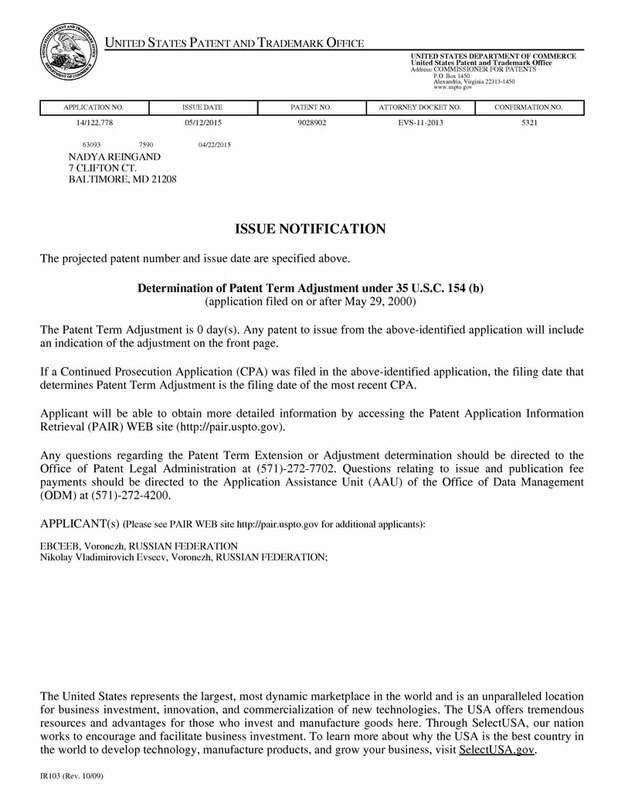 Claims 5 and 8 has been rejected under pre-AIA U.S.C. 103(a) as being unpaintable over Poilane (US Patent 5,593,712), hereinafter “Poilane” in view of Booras (US Patent No. 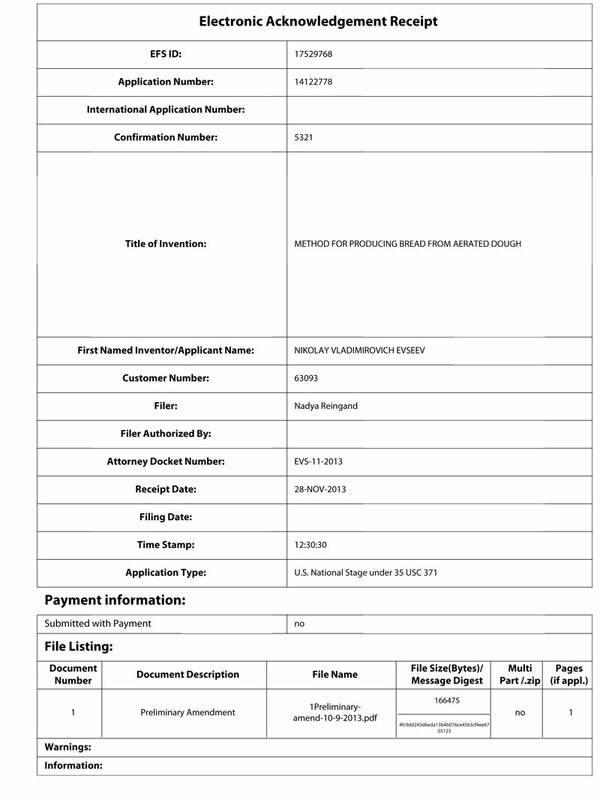 3,424,590), hereinafter “Booras” as applied to claims 3, 4, 6, 7 and 7, and further in view of Juchem, hereinafter “Juchem” (US Patent No. 5,5495922). We respectfully disagree for the reasons started below. 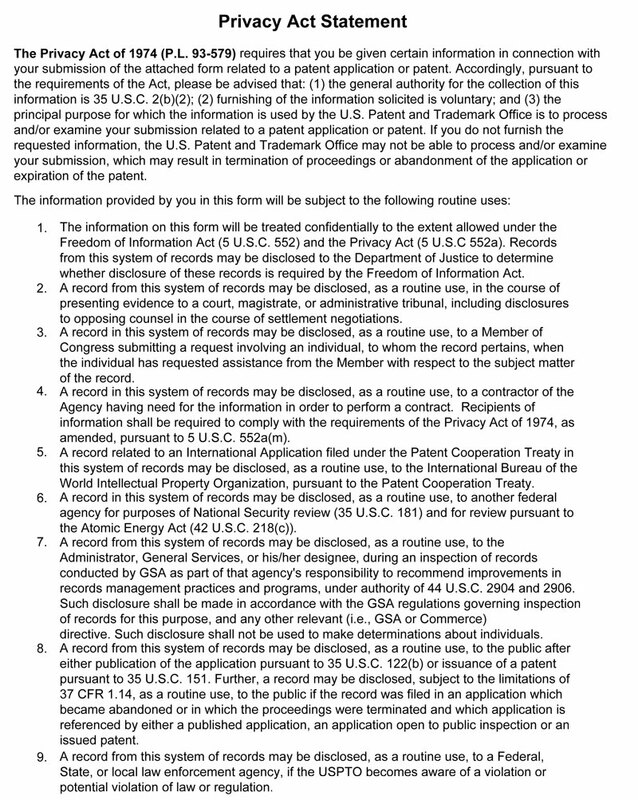 Rejections to claims 5 and 8 have been overcome as being dependent on the independent claim(s) 1 as applied above. Regarding claim 5, as it was stated, supra, the combination of Poilane/Booras does not teach the mechanical aeration of the current application. Juchem fails to teach the aeration per se. 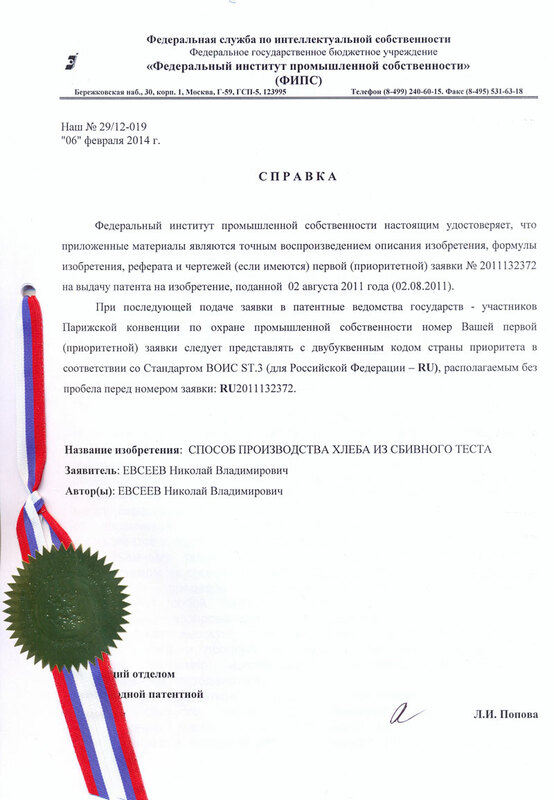 The invention of Juchem is in manufacturing of “MAKING FLOUR-CONTAINING EDIBLE SEMIFINISHED PRODUCTS” (title). And geared towards killing microorganisms naturally occurring in the semi-finished product, so it can be stored for extended periods of time in a standard refrigerator rather than only in a freezer (abstract). 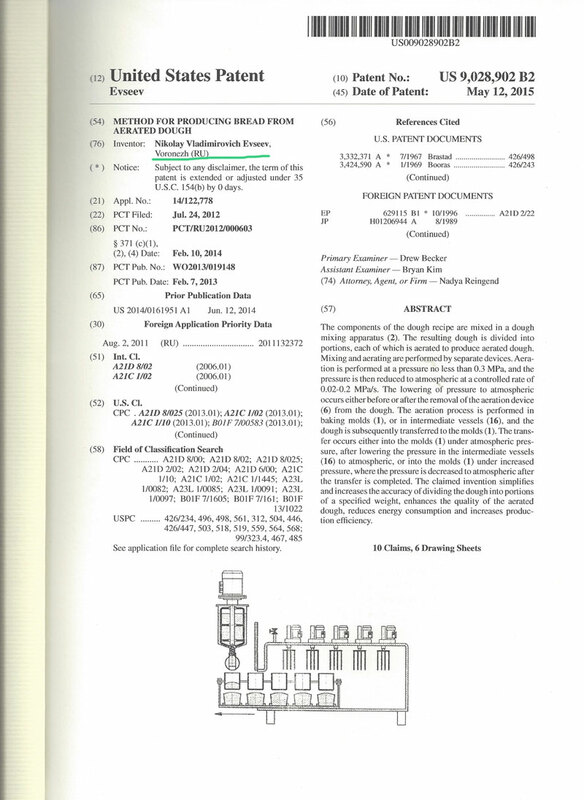 Moreover, Juchem teaches away from the current Application by specifying “[i]t is often advisable to terminate the treatment of a batch by abruptly lowering the pressure in the vessel to atmospheric pressure” (col. 3, lines 30-35) in order to meet one of the objectives of the Juchem reference, namely, further object of the invention is to provide a novel and improved method of reducing the content of microorganisms of flour-containing edible substances (col. 2, lines 19-21). 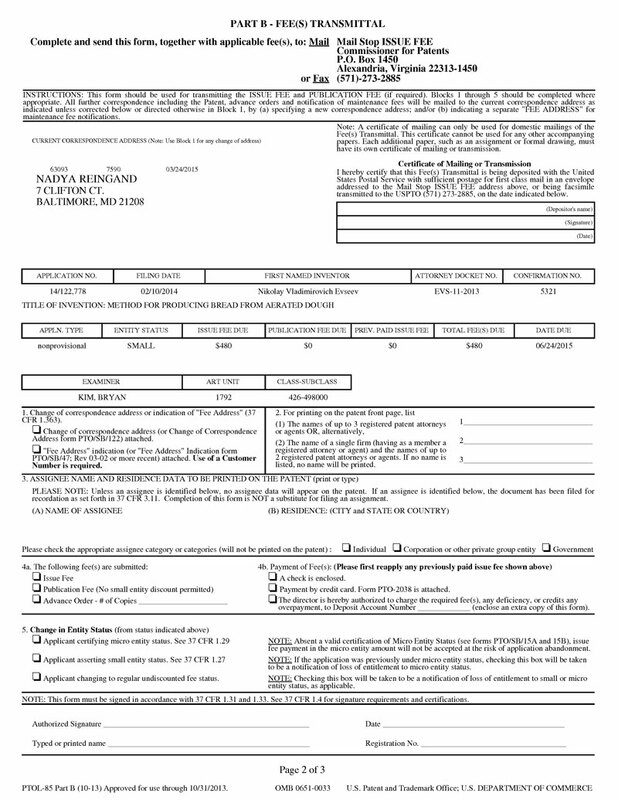 Per MPEP 2145 X. D. References Teach Away from the Invention or Render Prior Art Unsatisfactory for Intended Purpose. Moreover per MPEP A. 2143 in Example 1: “[w]hen the prior art teaches away from combining certain known elements, discovery of successful means of combining them is more likely to be nonobvious. ”KSR, 550 U.S. at 416, 82 USPQ2d at 1395. Therefore, it would not have been obvious to further combine Juchem with the combination of Poilane/Booras in order to mend the deficiency of the lacking the claimed “wherein decreasing pressure to atmospheric is performed prior to the removal of [[an]] the aerating device from the dough”. 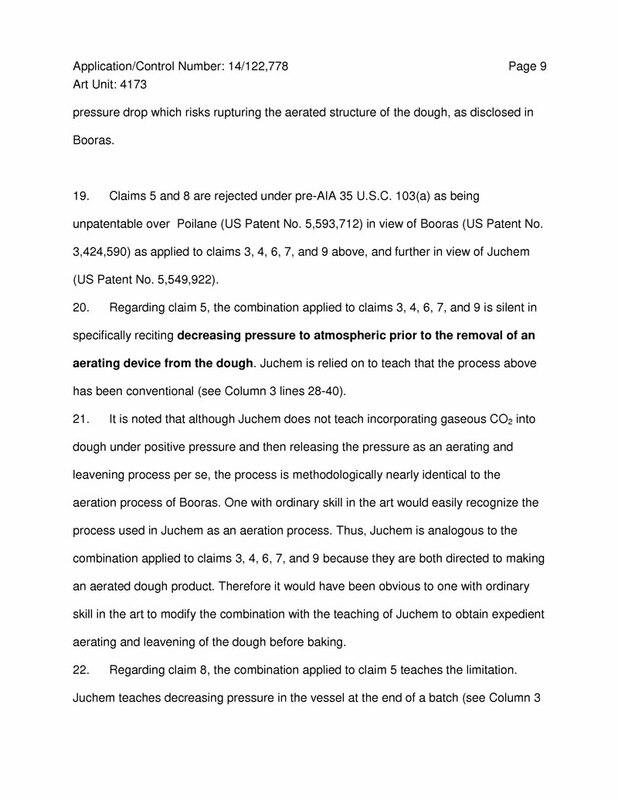 Regarding claim 8, Juchem fails to teach decreasing the pressure at the end of the batch since the Juchem reference does not teach the aeration per se. As well as combination of Poilane and Booras fails to teach the loading the dough to and from the intermediate vessel as stated, supra. Moreover, since Juchem reference fails to teach aeration (rising of the dough), it cannot be applied to teach that the pressure change can be better controlled within aeration. Therefore, we respectfully disagree that the combination of Juchem with Poilane and Booras teaches the limitations of claim 8. In summary we would like to offer following table to indicate the differences between the current Application and the prior art. 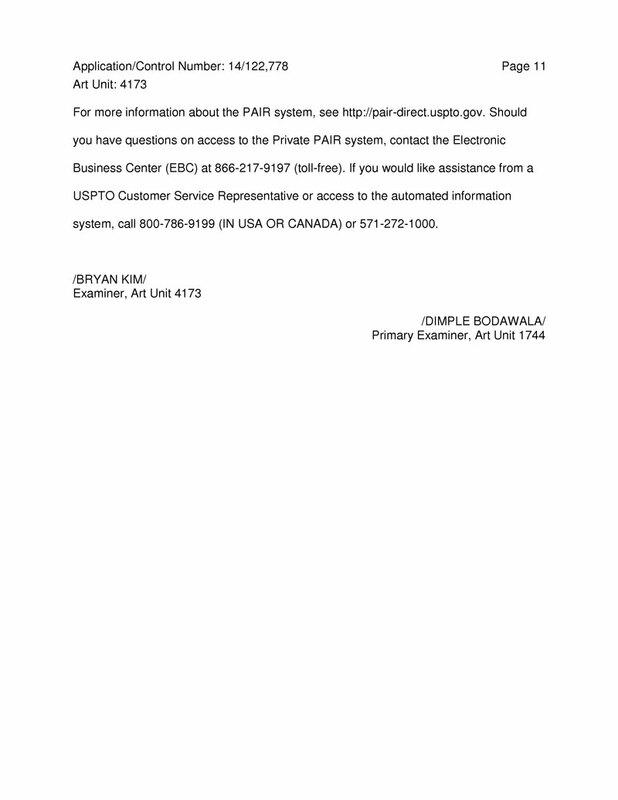 It is believed that all pending claims have been addressed. No new matter has been presented. In view of the preceding amendments and remarks, we submit that rejections for claims 1-10 have been overcome. Reconsideration of this case is therefore requested. 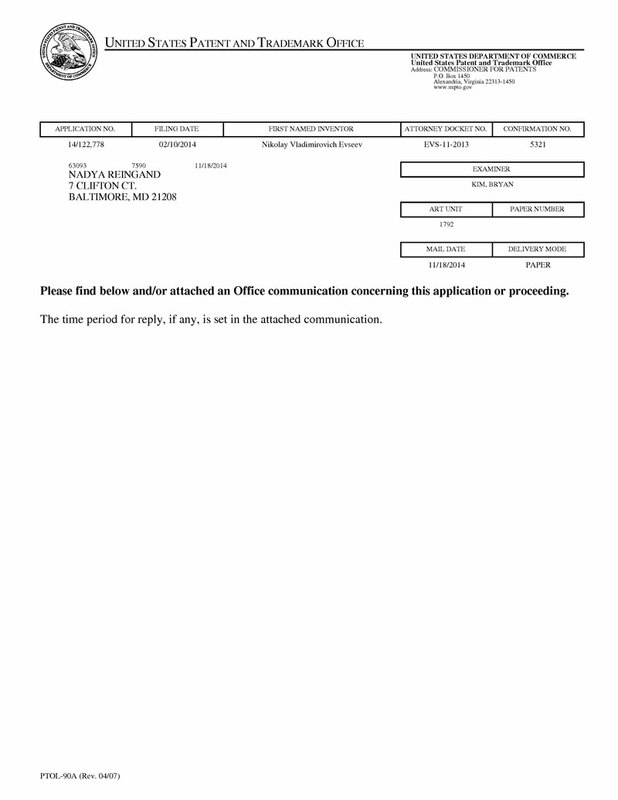 Should the Examiner consider that a conference would help expedite the prosecution of this Application, the Examiner is invited to contact the undersigned to arrange for such an interview. No fee is believed due. wherein decreasing pressure to atmospheric is performed at a controlled rate. Claim 2 (currently amended): The method according to claim 1, wherein conducting the mixing and aerating foaming of the dough is performed by the separate devices each of which is using devices designed specifically for mixing and aerating foaming processes, respectively. Claim 3 (currently amended): The method according to claim 1, wherein performing [[the]] said aeration foaming process is carried out under a pressure of no less than 0.3 MPa followed by decreasing pressure to atmospheric. Claim 4 (previously presented): The method according to claim 3, wherein decreasing pressure to atmospheric is performed at a controlled rate, between 0.02-0.2 MPa/s. Claim 5 (currently amended): The method according to claim 3, wherein decreasing pressure to atmospheric is performed prior to the removal of [[an]] the aerating foaming device from the dough. 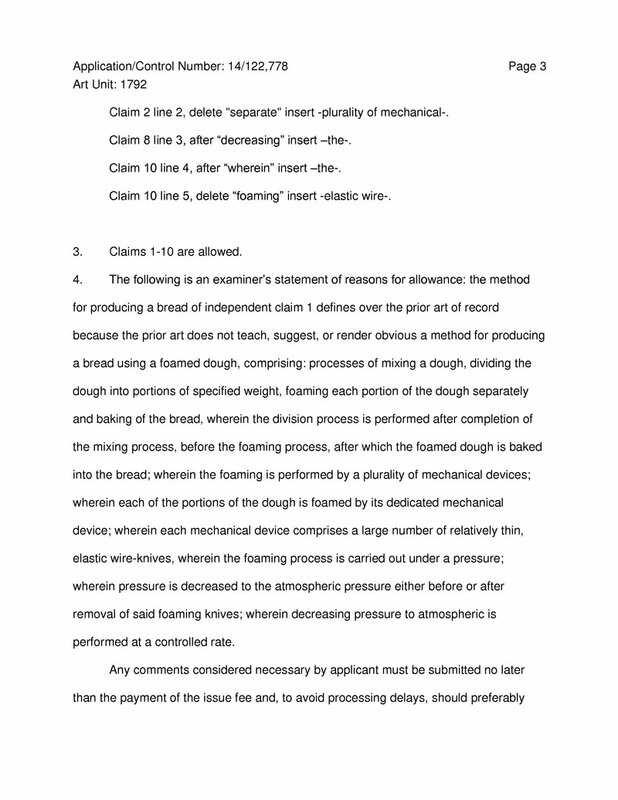 Claim 6 (currently amended): The method according to claim 3, wherein decreasing pressure to atmospheric is performed after the removal of [[an]] the aerating foaming device from the dough. Claim 7 (currently amended): The method according to claim 1, wherein the aeration foaming process is performed in intermediate vessels inside of which the dough is temporarily transferred for foaming with a subsequent loading of the dough in baking molds. Claim 8 (currently amended): The method according to claim 7, wherein the loading of said aerated foamed dough from the intermediate vessels into the baking molds is performed under atmospheric pressure and the loading is performed after decreasing pressure in the intermediate vessels to atmospheric. Claim 9 (currently amended): The method according to claim 7, wherein the loading of the aerated foamed dough from the intermediate vessels into the baking molds is performed at the same increased pressure that the intermediate vessels are under during the aeration foaming process, and decreasing of the pressure to atmospheric occurs after loading the dough into the baking molds. wherein baking molds are capable of withstanding the foaming pressure and shaped to fit the foaming knives. 6. В итоге было принято решение о выдаче патента. 7. Была оплачена пошлина и поданы документы на выдачу патента. 8. Поступило уведомление о выдаче патента. Текст патента на сайте патентного ведомства США.